Q: R2400 / R1800 Waste Ink Tube & Bottle Installation? 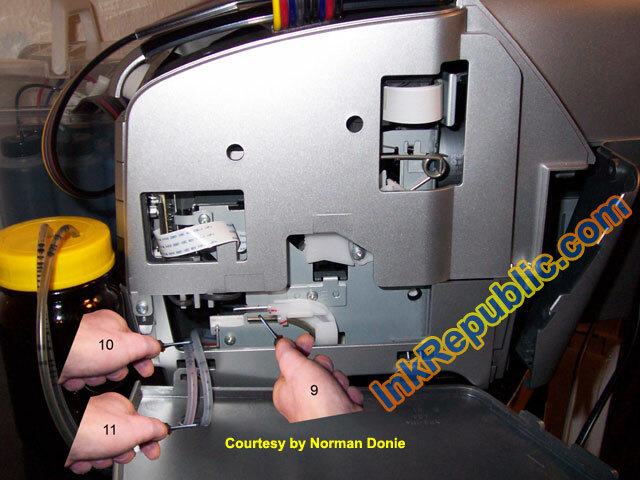 The following pictures show you how to install waste ink tubes and bottle in Epson R2400 and R1800 printers. Move 1 to 3: Remove the three screws with a plus screwdriver. Move 4: Insert small minus screwdriver into marked opening. Careful move down hand so the backside will open up a bit. The backside opened up. For removing the side its opened wide enough. If Move 4 does not work right try to move screwdriver like in Move 5 and 6. Now lets go for the Side. Move 7 and 8 is same thing like Move 4. Side is already open now. The way to the waste ink tube is free. Remove the Tubes (Move 10) from original place (Move 9). (Move 11) I used the shortest way to lead them out of the printer. Same steps just done backwards to get the printer back to work in no time.